Suitable for USB-Simulator Commander, R/C transmitter or joysticks! All models are instantly scalable! For 39.90 € up to 139 € you get the flight simulator with the best graphic performance and best flight physics. Whether a DVD or the instant download there is no better RC flight simulator available anywhere in the world for such a great price! Ready to fly after Download! 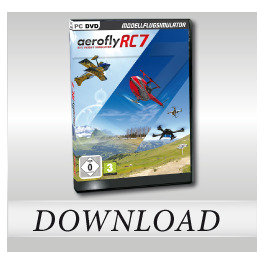 Users, who purchse the aeroflyRC7 as a download, can immediately get started flying. At the end of the ordering process an activation key will be sent automatically. If you already have a USB-commander or transmitter with USB adapter, he can fly with these. If not, you can still fly with mouse control! Universal for USB simulator commander, remote control or joysticks! The aeroflyRC7 will recognize any USB-Commander, whether it's recommended as game controller under Windows. You can also use an IKARUS GameCommander or an RC transmitter with USB adapter. The user is no longer bound to any particular hardware. Of course, for those who don’t have a commander IKARUS offers a matching USB commander. It sounds unbelievable, but with the aeroflyRC7arrives a new function, which increases the model selection infinitely. Each model, whether fixed wing model or helicopters, can be adjusted in size, up to 50% to 200% of the original size! A complete list would blow this out of proportion, listing all the jets, aerobatic models, gliders, flying wings, electric, gas or turbine powered helicopters, quadrocopters, foam models, shock flyers, racing aircraft, multi engine aircraft, tandem helicopter and much, much more. With the aeroflyRC7 you will get everything you ever dreamed off as an RC model. The website www.ikarus.net features a model gallery showing virtually all models. The aeroflyRC7 is actually fully equipped making it the best IKARUS flight simulator of all time. There are extremely realistic photo sceneries of many American, European and worldwide existing model airfields and slopes. They are supplemented with fascinating 4D sceneries with customizable visual and weather conditions, providing an incredible plus in flying fun through many challenges and follow mode flight. Among them are popular and unusual sceneries such as the famous Wasserkuppe (Germany), Hahnenmoos (Switzerland), Las Vegas at night (USA) and many more. The aeroflyRC7is based on a completely new realistic flight physic simulation. The processes calculated in real time have been expanded several times, creating the ultra realistic flight feeling of the aeroflyRC7. The even faster calculation, strictly based on the physical parameters has a noticeably affect on the flight behavior of the models. Looking for a Mac version ?